I know this is coming days late but since the Hubby could have seen this ahead of time I couldn't post. Anyway, just wanted to share this super quick but super cute Father's Day gift that Aria made for her daddy. 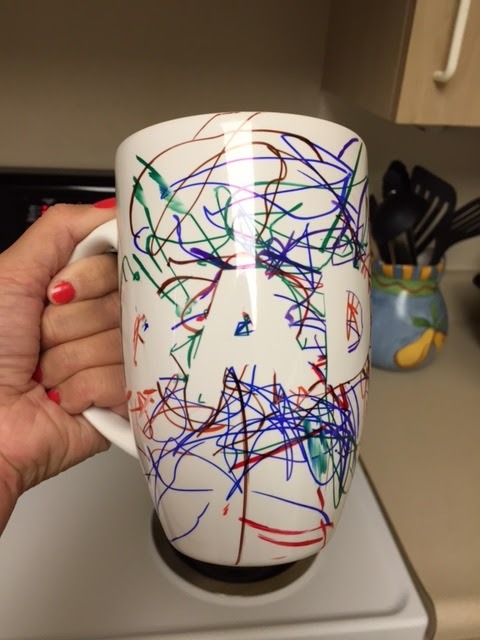 For this project I used permanent markers and a white mug that I snatched up from Target (10% off with cartwheel. Score!) And yes, I let my two-year old use permanent markers. We went one at a time and she managed to keep it off of her body. Woot! So first I printed off the word DAD onvinyl with my handy dandy cricut. Then I stuck it on the mug and let Aria have at it with the markers. She was pretty stoked. I then let the ink dry a bit and took off the letters. Lastly, bake the sucker on 375 for 30 minutes to make it permanent and voila! You can find the original source here. She used paint with her little ones but since I have used permanent marker in the same fashion before, I stuck with those. Personal preference. You can definitely use this technique in many different ways for all sorts of cool things. Let me know what sorts of awesome projects like this that you imagine up!